Just because the confab is ending, it’s no reason not to acknowledge the loving assembly of super-fantastic women pulled together by the curators at the Grolier Club for the astonishing exhibition, Extraordinary Women in Science & Medicine: Four Centuries of Achievement, which closes today. Inside the Club’s small gallery, ten cases and other repositories enclose the names, histories, portraits, papers, and publications of 32 remarkable women that deserve high praise and high fives. Yesterday the gallery was packed with academics, admirers, school groups, and bibliophiles who couldn’t contain themselves at their astonishment at the relative obscurity of some of these grand dames in our pop-culture-saturated psyches. 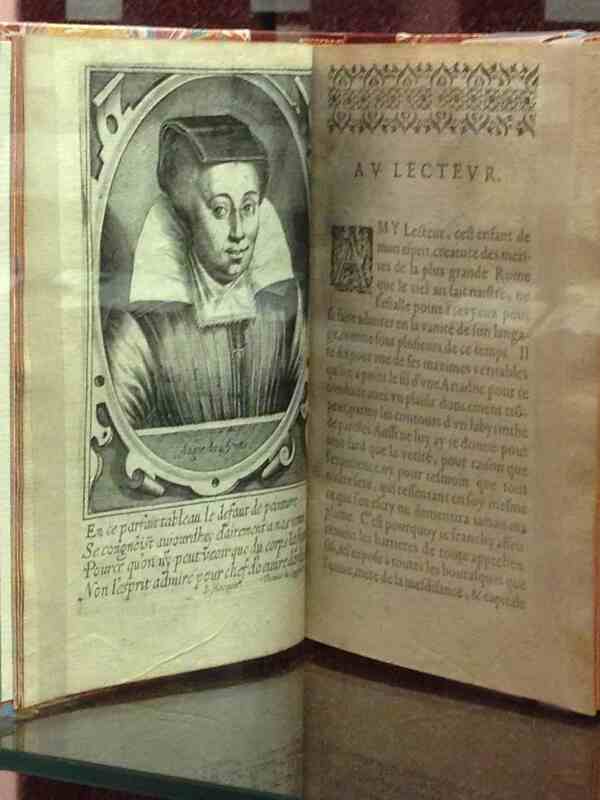 Louise Bourgeois Boursier (1563-1636) was the first woman to write a book on obstetrics – a pioneer in evidence-based medicine. Having observed 2,000 deliveries as a midwife, she personally delivered all of the children of Henry IV and Queen Marie de Medici of France, including Louis XIII. 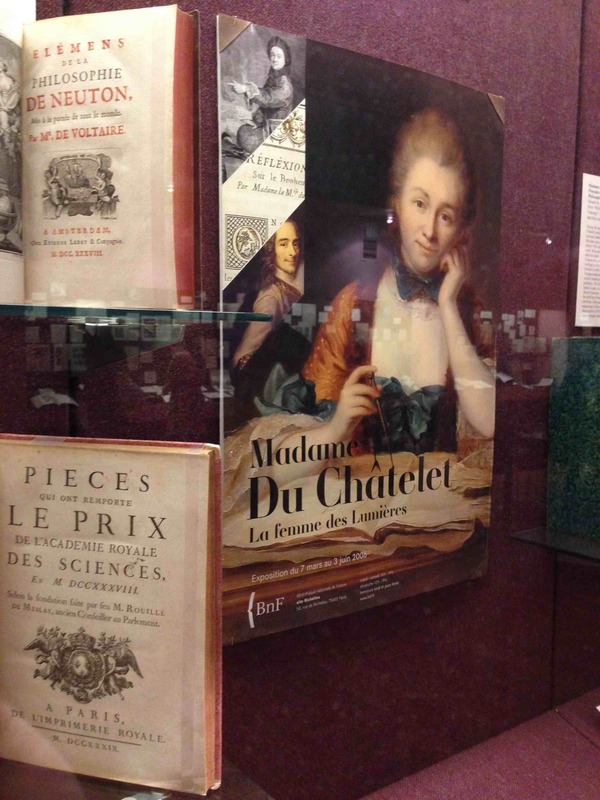 Physicist, mathematician, and author Madame du Châtelet (1706-1749) was the first to translate Newton’s work Principia Mathematica into French. To this day, it’s the standard translation for students there, although in its day, only Voltaire’s name was on it, since it was considered inappropriate to print a lady’s name on a frontspiece. Her dad, who worked for Louis XIV, encouraged her scientific accomplishments, but her mom bucked her all the way. She worked on scientific philosophy, the properties of fire, and made breakthroughs in the understanding of kinetic energy – a foundation of the 150-years-later E = mc2. Laura Bassi (1711-1778) was the first female physics professor in Europe and the second woman in Europe to actually have a university degree. Remarkably she still had 12 children, had a cheerleader in Pope Benedict XIV, and had the reputation and chops to do most of her work from home. Lord Byron’s daughter, Augusta Ada Byron, Countess of Lovelace (1815-1852) created, according to some, the first computer program. She translated an Italian engineer’s description of the analytical engine designed by mathematician Charles Babbage, but she added a lot of her own notes to explain its difference from earlier incarnations and explained the steps by which it could perform complex calculations. She felt it was important to use calculating machines to do more than mathematics, and she speculated that a computing engine “might compose music” and other “poetic” things. 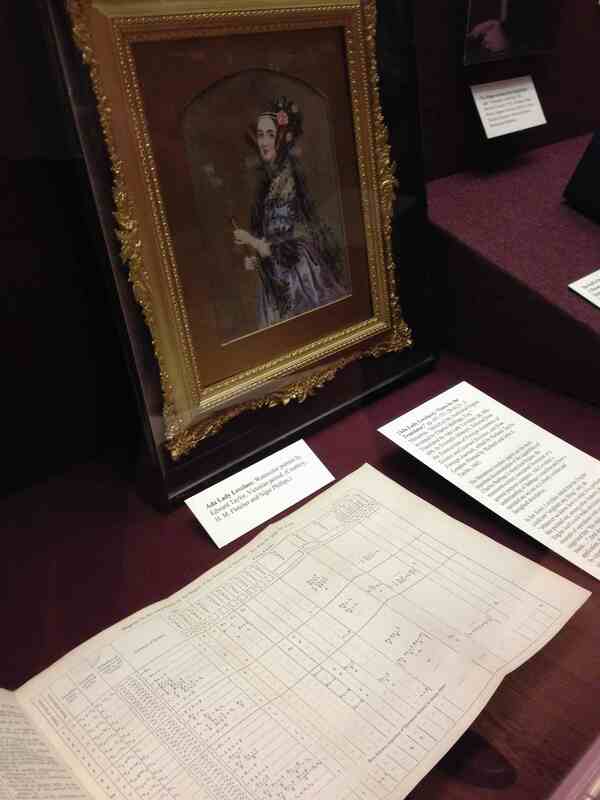 Everybody knows that Florence Nightingale (1820-1910) innovated modern nursing, but the exhibit showcased the fact that she got her ideas across because she was an expert statistician. She used stats to kick-start evidence-based healthcare. Think about it: life before Excel. Madame Curie (1867-1934), along with Florence, is the most famous of the Grolier group – the first person (and only woman) ever to have received two Nobel Prizes in two scientific disciplines (physics and chem). After discovering radioactivity, polonium, and radium with her husband, the Polish super-achiever applied radiology to help surgeons deal with battlefield injuries in WWI, accompanied by her 17-year-old daughter, Irène (1897-1958). Irène also later won a Nobel Prize in Chemistry for creating radioactive elements. New Yorker and Nobel-winner Gertrude Elion (1918-1999) never got a doctorate, but climbed her way to innovation from a job as a lab assistant. Say thank-you to her for inventing the first anti-cancer drugs, anti-viral drugs, and drugs to enable human organ transplants. Her pharma inventions treated leukemia, malaria, meningitis, and led to the development of AZT. According to the curators, the show – which includes Curie’s apparatus, Ada’s portrait from London, a box showing how pre-mainframe pioneers tracked and sorted results of their experiments, and other items – will have a second life as a traveling exhibit and website. Until then, find out more by picking up the catalog, crammed with interesting essays, to this unforgettable tribute. 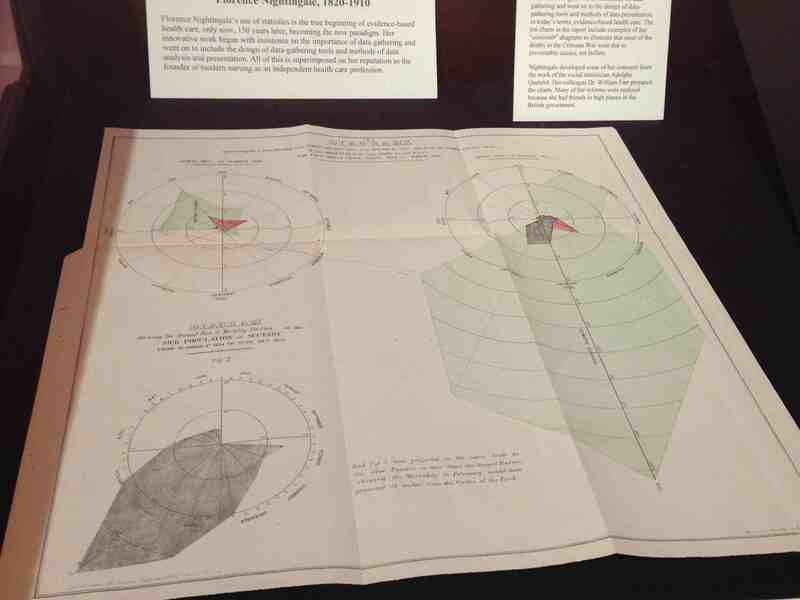 This entry was posted in History, Museums, Technology and tagged history, museums, science by mssusanb. Bookmark the permalink. Fascinating ! Where’s the Grolier Club? Gramercy Park? Did you see the Times review of two Gilded Age exhibitions today ? They both sound like little gems – I hope I get to NYC before they close, especially the exhibit at MCNY. Hope you’re having a great weekend – I miss you! Hi, Chris — The Grolier Club is devoted to books, libraries, and the art of publishing, and it was founded in 1884. It’s located at 47 East 60th Street, right around the corner from Barney’s! Come visit!! Golded Age just opened, so you’ll be able to see it! Jean Paul Gaultier, on the other hand….you have until February!